British scientists have developed a portable microwave scanner to help police identify individuals carrying concealed guns and knives. It is small enough to be used covertly, at some distance from the subject. The device is based around microwave radar technology and is designed to pick up the "reflections" of weapons concealed beneath clothing. Some officials believe technology like this could help increase the effectiveness of stop-and-search. The existing prototype is suitable for the detection of guns, but researchers say subsequent versions of the technology will be able to identify concealed knives as well. The new device employs low-power microwaves to identify weapons, using similar wavelengths as the body scanners currently in use at a number of airports. However, Professor Nick Bowring from Manchester Metropolitan University, who led the development of the new device, said it worked on a different principle. Unlike airport scanners, the portable machine does not produce an image of the subject, it only analyses signals. "It is designed to work out on the streets and is not (restricted) to a closed, controlled environment," Professor Bowring told BBC News. A human operator will transport the device, using it to direct microwave emission at a person of interest. Return signals - microwaves reflected back towards the device - are picked up, sensed and analysed. "[The scanner] does a lot of computing and processing of the signals it acquires. It puts them all together, analyses them over a short period and makes a decision," said Professor Bowring. 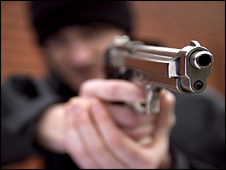 "It works on the principle that the radar returns from people, when they are carrying a gun or a knife, look different. And we pick up on those small differences." So-called neural network technology is employed to identify signals from concealed weapons and to ignore those from everyday items. Similar technology is used in the automatic recognition of car number plates. Professor Bowring said he and his team had found ways to reduce the numbers of "false positive" readings to a "very low level". Because of sensitivities surrounding its use, he could not say what distance the device worked over, but explained it was a "useful stand-off range". Researchers are reluctant to release pictures of the experimental set-up for similar reasons. Tests are currently being carried out by the Metropolitan Police's operational technology department to see how the scanner could work in practice. If those trials are successful, a device could become available to police forces within two years. Catherine Coates, head of innovation at the Engineering and Physical Sciences Research Council (EPSRC), said: "This device could save lives and free up valuable policing time currently taken up with gun and knife detection." Anita Coles, policy officer for Liberty, told BBC News: "We welcome scientific innovation in the fight against crime but this kind of technology needs public scrutiny and foundation in law. "The causes of violence also need attention. You will never eliminate all the guns, knives, bottles and glasses so it's important to consider other conditions that foster conflict." In a statement, Stuart Ibbotson, head of engineering for the Metropolitan Police, said: "We are still at early stages and a way off deploying operational capability yet, but so far, results are very encouraging. "This kind of device would be of great service to officers, helping them to catch people carrying guns and knives without putting themselves in increased danger. It could also help to target stop and search to further increase its effectiveness." The number of firearms operations rose by almost a fifth last year in police forces in England and Wales. Officers fired weapons seven times - up from three incidents the year before, but still fewer times than in 2001. The Home Office figures showed a drop in firearms operations in some police areas commonly believed to have significant gun crime problems. Professor Bowring said the scanner had been developed relatively cheaply, at a cost of only a few hundred thousand pounds. The project involved researchers from MMU, Manchester University, Newcastle University and Queen Mary University of London. It was funded by the EPSRC, supported by the Metropolitan Police and the Home Office Scientific Development Branch.